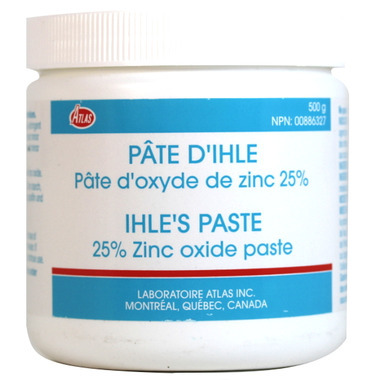 Atlas Ihle's Paste 25% Zinc Oxide is an astringent providing topical protection, used to treat minor irritations, diaper rash, chapped skin and minor cuts. Apply as needed in cases of dermatitis and diaper rash. For external use only. Keep out of reach of children. Not to be taken internally. If accidental ingestion occurs, contact a Poison Control Center. If irritation persists or worsens, discontinue use and contact a physician. Active Ingredient: 25% Zinc Oxide. Inactive Ingredients: Corn starch, heavy mineral oil, anhydrous lanolin, paraffin and white petrolatum. Best cream I ever used for cracked hands and at a great price! Heals fast and is very soothing! amazing ! absolutely the best diaper cream. its my go to for my munchkin. This one is a keeper. I use it on myself for eczema. After having rotated between a handful of different zinc creams, this one wins on many points. It is very soothing, unfragranced and actually healing. Its thickness is a bit off putting but mixing it into my lotion works well for me. Happy customer. This is the best diaper cream!!! Its a must-have!! A friend told me about it and it works perfectly for rashes as well after baby has a bowel movement it wipes everything right off so well.. Very happy with this product and Will be reordering more!! A little expensive but recommended by my doctor and the only cream Iâ€™ve found to really help severe diaper rash. Well is also the only place I have been able to find it. My little one had a really bad diaper rash started using this and within an hour i seen a difference. we always use this every bum change and have yet to see a rash since. Love love love this diaper rash cream. Very thick and it stays put. Not watery at all like some of the other creams on the market. I keep reordering. This stuff is amazing!! My pediatrician recommended this to us when my little one has a case of diaper rash. You can see results after one day of using it. I highly recommend this product to other parents looking for a good barrier cream. Great cream. Price is way better than other big companies. Fast delivery and great service. The paste works as a fantastic barrier cream and daughter hasn't had diaper rash since using it. It goes on quite easily. Highly recommend Well.ca and this product. Great diaper cream, thick and stays where you put it and does a great job clearing up and preventing rashes. It also does not smell. Once you get to the bottom of the jar it can be really hard to get the cream out and not all over your hands, but there is no winning in this respect, since it is really hard to get the last bit of cream out of a squeeze tube too. Awesome diaper cream. Clears up my daughter's diaper rash in a day or two. And works great preventatively. This is the best brand of Ihle's if you ask me. Stays on just as well as Rougier but much easier to apply. NOTHING works better on diaper rash. I've had this paste in the nursery 4 weeks after my sweet girl was born and it has never let me down. Yes, the packaging is not cool or hip like other boutique creams out there but is no nonsense and works. Has not failed me yet! GREAT PRODUCT FOR ANY AGE SKIN! My sons were born at 25 weeks gestation and were hospitalized for 4 months in the Neonatal Intensive Care Unit; they used Ihle's Paste exclusively for the preemies and I completely understand why. It works quickly and effectively on diaper rash, even for the most sensitive of skins, but it works well to also heal other common skin irritations as kids grow and even on adult skin. So glad to have found it on WELL - difficult to find once out of the NICU, and I'm committed to this product for EVERYONE in our family. Do not let the price deter you; a little goes a long way! Best diaper cream to quickly get rid of the redness caused by diaper rash. Repeat customer of this product and would definitely recommend to anyone. Absolutely love this product. Only thing we use when the baby' bum is sore. Even the NICU at the hospital uses this brand. Yes it is expensive, but a time honoured and history tested product. I use it every other day as a preventative measure but if a rash does start up, it will disappear in 24-48 hours if put on a clean and DRY bum. I also use the mini travel size in her diaper bag. Is a good bum cream! This stuff is amazing! I tried so many other creams on my daughters diaper rash and nothing worked. I saw results with this cream in just a few days! No other bum cream compares to this, its a must have! best cream ever!!! only thing that works for my daughters teething rashes!! love this stuff! Clears up diaper rash in a day and if used daily, will keep bum happy. Came recommended from my midwife and would definitely recommend it to anyone! This paste worked really well to help heal the bad diaper rash my son had. I ordered this for my 5 month old's diaper rash based on the reviews and am so glad I did. She has had a diaper rash for the majority of the time and blistering at times. Nothing would make it go away, just slightly better...until now. After a day of use her never-goes-away diaper rash has gone away! I have tried sudocream and peneten cream and a few others with no success. I don't care for the smell, but it's well worth it and goes on very smooth. Great value for something that actually works! I use this day and night for my father's pressure sore. Mixed with some antibiotic cream, it's kept him healed for many months now. I keep buying in advance just in case we run out and there's no more. Worked amazingly on LOs diaper rash. Also use it every night to prevent diaper rash and it works really well! Hands down this is the best bum cream out on the market. Forget all other diaper creams! This one clears up the worst rashes fast and keeps babies rash free with daily use. Bonus: no perfume! One of the best diaper creams on the market. My daughter got a terrible diaper rash once, and her pediatrician recommended this product. Since then I use this for her daily basis, and her (cute) but is rash-free! Great product, rash clears up w/in 24 hrs. We tried everything, and this is the only cream that worked on our kid's diaper rash. Our paediatric dermatologist recommended trying it. And what's most amazing is it costs a fraction of the other barrier products we tried. A pharmacist over 50 years made up this paste and i was really surprised to find it here. My grandson was getting diaper rashes and a red bum after bowel movements. I purchased 2 of the large sizes ..one for my house and the other for his. It cleared up his diaper rash almost over night. My daughter in law was very surprised and pleased with the results. She avoided using diaper creams but was sold on this one becasue of the results. Best cream out there! Have used it since baby was born and it works every time. This product really helped my son's terrible diaper rash. He had huge welts that were bleeding and THIS was the only cream that helped clear it up. I purchased several other creams and even had a prescription and Ihle's Paste was the ONLY cream that worked! I highly recommend Ihle's Paste! This is the best diaper rash cream - period! I buy several tubs at a time so that I always have it on hand. It goes on really thick (like cream cheese), but this makes a great barrier between your little one's bum and a soiled diaper. I have run out twice and both times I used other products which resulted in terrible diaper rashes on my little one. It is hard to find, but thankfully Well.ca stocks it. I can't recommend it enough. Best diaper cream! Got this for my mom, works amazing. Rashes disappear immediately. The best for stubborn rashes and it's impossible to get anywhere else! this product is by far the best I have ever tried at getting rid of diaper rash. It's not always available in stores, thank you Well.ca for offering it. I was so happy when I found it on your site!!! This is the best diaper rash preventing (and healing) cream that I have used on my baby. It is great because it really creates a long lasting barrier between the skin and the diaper. I would recommend this product. The best diaper rash cream there is! This is the only diaper rash cream that works! Fantastic! Absolutely the best cream to prevent diaper rash. This is the only diaper rash cream I use. My 3 children have all used it and they have never had a diaper rash. One drawback is keep a box of kleenex near the change station as it does not come off your fingers easily after application. Excellent product...can use it for more than just diaper rash...couldnt find it anywhere in canada. This stuff is really hard to find, but is absolutely worth it. It does an excellent job of staying put and was a lifesaver with both of my rash-prone kids. I've tried LOTS of diaper pastes and this is my go-to one. Fantastic product! Very hard to find - so happy to see it here on Well.ca!